The Bartholomew the Adventurer Trilogy and the Orville Wellington Mouse adventures are multi-leveled stories and have been compared to Chronicles of Narnia, The Hobbit, Neverending Story, etc. The books have underlying themes of ethics, metaphysics, philosophy, quantum physics, and spirituality. A common theme is the idea that there is no magic, only science we don’t understand. I am 65 years old and have spent my life studying all these topics. I have a degree in psychology from Georgetown University. The books were written to provide a different way to view the world we live in. To see all life as a single force, all life equally precious, no matter the form. A world where violence is not necessary, a world where the protragonists walk of their own accord into the ferocious fires of life and are changed forever by their difficult choices, by their own sacrifices. A world of empathy, kindness, and love. And of course, ten foot tall ancient robotic rabbits and gigantic carnivorous centipedes living on post apocalyptic planets! I spend several months working out the plot of each book. That’s the most fun. The plots are linear but complex, with early events having a great effect on later events, lots of twists and turns and red herrings. Once the plot is basically done (about 10 pages for a 70k word book) I start the first draft. The framework of the plot remains the same but all kinds of side adventures will pop up along the way and new characters appear out of nowhere. It’s quite exciting – I feel as though I’m reading the book in slow motion, and can’t wait to find out what happens next. As far as the main characters, however, they are all created when the plot is written. The main characters are created on an as-needed basis. 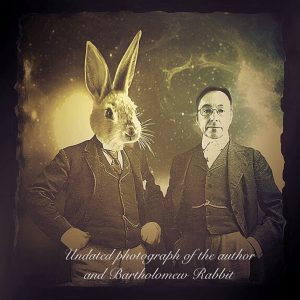 For instance, in the first book of the Bartholomew the Adventurer Trilogy, Bartholomew is a self-absorbed rabbit searching for a missing object which he cannot name or describe. As it turns out he has a great natural talent for something called ‘shaping”, or creating physical objects using the power of the mind. The mind is not the physical brain, but is the deeper part of us which exists outside of space and time. On the surface, this would be called magic. I needed a scientist as a counterpart to Bartholomew, so along came Oliver T. Rabbit, Director of Research and Material Acquisitions at the Excelsior Electro-Vacuumator Corporation. Oliver T. Rabbit comes to see the world as a far more complex place than he had originally thought. He also comes to understand the science behind shaping and many other mystical skills. All my characters serve a purpose, they are the archetypes found in all good stories. There are no humans in my books, the world of Bartholomew and Orville is Earth in the distant future, long after humans are gone. Non-human characters like rabbits, mice, rats, robots, and alien forces allow me to discuss a great number of social issues without people taking it personally. It is a way to view human nature objectively. These books are are incredibly fun to write. The characters become a force of their own and I simply watch and listen and record their adventures. Absolutely. Each character has a unique personality and becomes a friend, someone I know. I listen to them interact, put them in different situations and watch how they react. What happens when Sophia tells Orville the pit is full of giant carnivorous centipedes? Ha! I often laugh, cry, and make funny noises while I’m writing. Write a lot. Edit even more. When you’re done editing, then edit some more. I edit each book from start to finish a minimum of 8 or 9 times. Each time I think I’ve got it, then on the next edit I find tons of things to change. It’s like sanding a table top. Sand it, run your hand across it and then sand it again. I self publish on Amazon / CreateSpace. It’s a new world out there in the publishing industry, just like the music industry. I like having complete control over my work. I was a graphic designer for 35 years and design all my own covers and book layouts. Billions of books but the good ones will float to the top. Success in writing is glacially slow. It’s an awesome way to avoid paying any income tax.